Your tour starts in Brisbane at 7.45am. You will be driven to your first stop in the mountain-top cloud forest to enjoy the view and have morning tea and may see a Platypus in the stream. From there you will be taken on a half kilometre subtropical circuit and decent to the picturesque Natural Bridge rock arch for a guided walk. After lunch we will take a short walk with a few steps which leads you under a spectacular waterfall, with the opportunity to stop for a cooling swim if the conditions are good, then we will retrace our steps and find the Ancient Antarctic beech forest to a view of northern New South Wales dominated by Mount Warning, the lava plug at the centre of the erosion caldera of the extinct Tweed shield volcano. You will arrive back to Brisbane sometime around 4pm. Dominating the Gold Coast's western skyline, Springbrook's cool forests and mountain streams offer views of impressive landscapes and stunning walks among subtropical and temperate rainforest, open eucalypt forest and montane heath. If you like to take photos then this is the trip for you, spectacular waterfalls and cascading and tumbling creeks are dominant features in this Gondwana Rainforests of Australia World Heritage Area. Southern cliffs in Springbrook (and Lamington National Park) are part of the remnants of the northern rim of the huge, ancient Tweed Volcano. 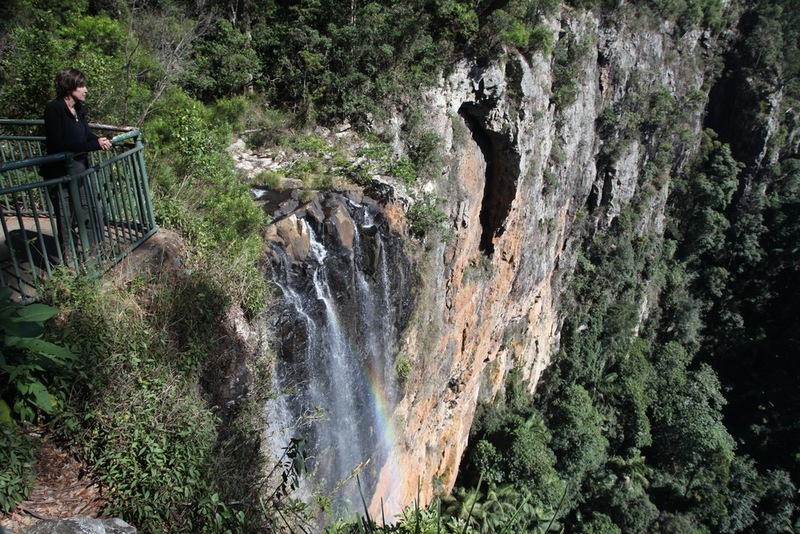 The Springbrook National Park comprises four reserves on and around the plateau: Springbrook Plateau section along the crest of the plateau; Mount Cougal section to the east; and Natural Bridge and Numinbah sections to the west. The cliffs are resistant, volcanic based rhyolite. Rock overhangs are common and massive rock falls sometimes dislodge house-sized rocks. Several waterfalls will be seen form our walk on the relatively short track around 2 hours, in the Springbrook Plateau section. Some of the falls we will see are Twin Falls, Rainbow Falls, Goomoolahra Falls, Kadjagooma Falls, Ngarri-dhum Falls, Gooroolba Falls, Poonyahra Falls, Poondahra Falls, and Blackfellow Falls and Purlingbrook Fallsand Tanninaba Falls. During the day you can spot green catbirds, wompoo fruit-doves and paradise rifle birds, it is also home to threatened species such as the cascade tree frog, sooty owl and koala. The cave is home to glow worms and a colony of micro-bats.